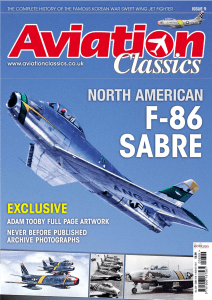 Friends – As I began my second issue as editor, I found myself dealing with an aircraft I thought I knew well, the F-86 Sabre. As time went on however, more and more came to light that I was unsure of or found questionable despite the oft-documented history of the type. This is where I really began to understand the power of friends. Doug Dildy, an ex-F-15 driver and a tremendous aviation historian of note, introduced me to Dave Powers. Doug was writing the excellent Korean War section of the magazine and suggested Dave as the man to cover the naval variants of the Fury. As a docent at the National Naval Aviation Museum, Dave was well placed to research the types in depth, and did an astounding job as you will see. Of course since we were covering a Naval topic, Norm DeWitt’s suggestion of a piece on the 100th Anniversary of Naval Aviation was another great idea. He and Keith Draycott have produced an excellent piece on the celebrations. Doug also suggested that the man to write the rest of the issue was Duncan Curtis. 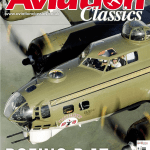 Thanks to Doug’s suggestion, this issue of Aviation Classics is as good as it is. Every now and then you meet someone who is simply the world expert on a given subject. This is Duncan Curtis, and his subject is most definitely the F-86. 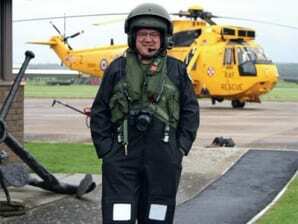 Duncan served for 24 years in the RAF as an airframe/engine technician, initially with search and rescue Wessex helicopters and then via Pumas in Central America to seven years doing airframe repairs on the C-130 Hercules. Since 2005 Duncan has worked as a technical author for Airbus. His interest in the F-86 began in 1974 when his curiosity was sparked by a photograph of Ben Hall’s F-86A in Aviation News magazine. Since then he has written six books on the subject and contributed a number of further magazine articles. He also runs a dedicated F-86 website, http://f-86.tripod.com. Basically, if someone is restoring an F-86 anywhere in the world, Duncan is probably involved in some way. Sitting in his home one day, a question of detail arose, so he disappeared into his prodigious library. He returned with the official air force manual of the type we were discussing and examined the engineering drawings therein. “Where on earth did you get that?” said I. “Oh, I have most of them for most models” said he! Nearly the whole magazine has passed before his eyes, so it is only fair to say Duncan Curtis is the co-editor of the F-86 issue, as he has contributed far more than I. Thanks Duncan, good job! Keeping on the subject of friends, this issue also introduces the work of Adam Tooby, a renowned artist who will be familiar to many aviation enthusiasts because of his work on the Airfix models boxes. As an avid Airfix collector myself, I was delighted when Adam contacted me asking if he could help with illustrating the pages of Aviation Classics. From now on, each issue will feature two double page artworks from Adam, exclusive to the magazine. This month he has chosen to depict Maj George Davis of the 334 FIS, 4th FIW on the 30 November 1951. On this day, one of the largest air battles of the Korean War took place, with F-86s intercepting a force of 12 Tu-2 bombers with La-11 escorts and a MiG-15 CAP. George Davis shot down 3 Tu-2s and 1 MiG-15 and damaged another Tu-2 in F-86A 49-1184. Davis shot down the MiG after he returned to the fray to help his room-mate, Capt Raymond Barton, who, as Barton put it himself, “had started to collect more MiGs, who seemed to be more than a little irritated.” Davis shot one of the gaggle of MiGs behind Barton down, and both returned safely to Kimpo Air Base. The other artwork from Adam is part of our tribute to the late Michael Fox. It is the 60th FIS Aerobatic Team in formation, their classic diamond. Michael’s sudden death in January occured just after he had completed his article on the 60th FIS, and shocked us all, as Doug Dildy, Duncan Curtis and I had all been in touch with him. Everyone at Aviation Classics sends their heartfelt condolences to Michael’s family, and thanks to his brother, John, for his support. It is hoped that Michael’s book on Sabre Aerobatic Teams of the World may yet be completed, as his artwork for it and research on it is mostly complete. They say that friends only die if we allow them to be forgotten. 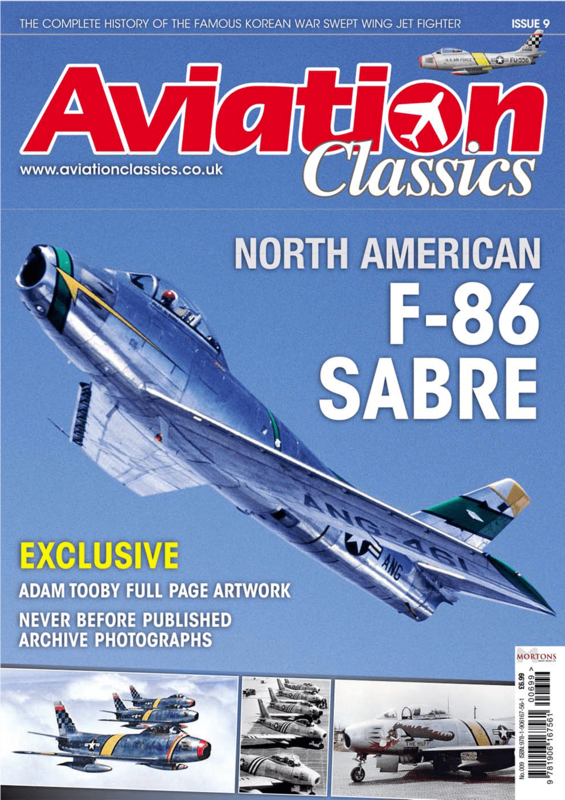 I hope that this issue of Aviation Classics helps the memory of Michael to live on. It was mainly German aeronautical engineers who pioneered the swept wing for aircraft, says François Prins. We tend to think that the swept wing is something that only came about with the advent of jet aeroplanes, but in reality it was being experimented with by several aircraft designers from the earliest days of manned flight. While powered aircraft kept to a simple design of fairly square wings with little or no sweep, glider enthusiasts were going further and adding sweep to the wings of their craft as the searched for better flight characteristics that suited a machine dependent on the wind. In Britain, José Weiss experimented with hundreds of model gliders before making a full-size tail-less glider with swept wings. It flew successfully in 1908, so he built another but this time powered by 12-hp Anzani engine driving two propellers. During the winter of 1908-09 it was tested at an airfield in Essex but, until some modifications were carried out, refused to leave the ground. Another pioneer of the swept wing theory was John William Dunne; he experimented with models before building a full-size tail-less glider with sharply swept back wings in late 1905. Encouraged by the success of the glider, Dunne built a powered aircraft which, after some initial problems, made several successful flights. Dunne built variants of the aircraft and one crossed the English Channel in 1913 to be demonstrated in France. With the coming of war Dunne ceased work on his series of tail-less aircraft. However, many of his ideas and designs were adapted by others including Westland Aircraft. They built a series of tail-less gliders and powered aircraft which culminated with the successful Pterodactyl IV of 1931. It was not put into production and the swept wing theory was not taken up in Britain by any of the leading aircraft designers and manufacturers of the day. The Versailles Treaty of 1919 forbade Germany to design and produce military aircraft. However, there was no mention of gliders and light sporting types, so the engineers who had worked on aircraft during World War One turned their talents to powerless flight. Gliding became a fast-growing sport and competitions held in Germany attracted participants from all over the world; it was seen as harmless and fun, but the data gathered from gliders could be used by the designers for other aeronautical applications. One of the many glider designers was Alexander Lippisch; he had worked with Dornier in the latter stages of World War One and was one of many men who found themselves unemployed after 1918. Lippisch applied for a post as an aeronautical engineer with Fritz Schweizer who wanted to enter a glider for the 1921 Rhön competition. Lippisch built the glider and soon afterwards joined forces with another glider builder, Gottlob Espenlaub. They continued their experiments with tail-less craft and in 1927 Lippisch produced the first of his Stoch gliders, which would later be developed to take power units. These were developed into his Delta design series, which would eventually lead him towards the Messerschmitt Me 163 concept. 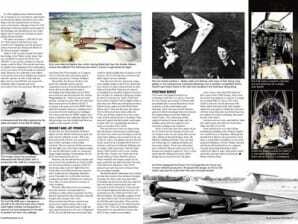 While Lippisch was experimenting with the Delta aircraft, the Horten brothers – Walter and Reimar – were building small glider models based on the Lippisch’s Delta tail-less design, but taking it further as a flying wing with the pilot and equipment housed almost entirely in the wing. They built and test flew large models that soon attracted the notice of the Deutsche Versuchsanstalt fur Luftfahrt (DVL) – the official German aircraft test organisation – who invited the Horten brothers to demonstrate a glider at an air show in Hangelar in June 1934. The DVL agreed to pay all expenses and the aircraft was shown to a large audience that included many influential members of the ruling Nazi party and the new Luftwaffe. When Reimar returned home to Bonn he started work on a second aircraft; this was for a glider, but he also had plans to build a powered version. Both Lippisch and the Horten brothers continued their experiments with tail-less and/or flying wings throughout the 1930s. The Deutsches Forschunginstitut fur Segelflug (DFS), the German Research Institute for gliders, but also covertly for powered aircraft, gave Lippisch the opportunity to build a glider that could be easily converted to take an engine. In 1938, Lippisch joined Messerschmitt AG at Augsburg; he now had the opportunity to develop his tail-less aircraft for one of the largest aircraft manufacturers in Europe. Some of his former colleagues from the DFS joined him at Messerschmitt and brought all his drawings and calculations for the rocket fighter that he had been working on before joining Messerschmitt. The glider prototypes – DFS194 V1 and V2 – that Lippisch had built were also transferred to Augsburg and the proposed powered aircraft was designated Me163 in the Messerschmitt catalogue. Early in 1939, in order to gain first hand knowledge of the Walter rocket motor that was scheduled to power the Me163, the DFS194 V1 was quickly modified so that the engine could be fitted. The aircraft was flown as a glider from Augsburg before being taken to the test centre at Peenemunde for powered trials. However, the outbreak of war halted work and the first powered flight was delayed until the summer of 1940. Trials with the light and very fast DFS194 encouraged the Luftwaffe high command and work proceeded on the first prototype Me163; this was flown from Peenemunde on 13 August 1941 for the first time and during trials it reached a top speed of 515mph (830kph). Meanwhile, the Horten brothers had joined the Luftwaffe and the special organisation known as Sonderkommando 9, where they were allocated the task of developing their flying wing concept. Work proceeded and was developed by the Gothaer Waggonfabrik AG – better known as Gotha aircraft – during the early 1940s. By 1942 work had commenced on the Horten Ho IX V1 prototype to be powered by two BMW 003A-1 axial flow turbojets. However, problems were encountered by the build-team at Gottingen when they found that the BMW engines were larger in diameter than originally planned. The first prototype was thus finished and flown as a glider in the summer of 1944. By this time the Messerschmitt Me262 jet fighter and the Me163 rocket interceptor had both entered Luftwaffe service. When the first powered Ho IX flew, now powered by Jumo 004B-1 turbojets, it was behind schedule. The test started well but two hours into the flight one of the Jumo engines caught fire and the pilot had to make an emergency single-engine landing. Unfortunately, the Ho IX V2 was destroyed in the fire. However, the aircraft showed promise and was ordered into production as Gotha Go229; the first pre-production example Go229 V3 was being made ready for flight when the Gotha plant at Friedrichsroda was captured and occupied by the advancing American army. Naturally, the Go229s that had been completed and those in-build were seized, as were other German advanced concepts at other locations. What the Allies discovered was amazing, they knew that the Germans had been working on rocket and jet propulsion but they had not expected the sheer diversity of aircraft designs and concepts. One of the Messerschmitt aircraft they captured was powered by a single turbojet with a nose intake, sharply swept back wings, a high tail and cannon armament in the nose. Designated P.1101, the aircraft had wing sweep back that could be varied in flight from 20 degrees to 60 degrees. The P.1101 had been selected as the future fighter for the Luftwaffe. Also discovered by the advancing troops was a similar design to the P.1101, which had been worked on quite independently by Kurt Tank of Focke-Wulf. Tank was not only an accomplished aeronautical engineer but also a fine test pilot; he insisted on flying any design he had been involved in. Tank’s Ta183 had been ordered early in 1945 for flight in May or June that year. Work was well-advanced when British troops captured Focke-Wulf at Bad Eilsen where Tank and his team were based. The Ta183 had not been built, unlike the P.1101 and all that could be seen were some scale models and hundreds of drawings. Tank was interrogated but did not give much away to those who were questioning him and he made no mention of the Ta183. the Me 262s. Further, the Ta183 was to be armed with four 30mm MK108 cannons which would be more than a match for the guns carried by any allied aircraft of the time. Tank had other variations of the Ta183 planned and each was more advanced than the preceding example. The British and the Americans were excited by what they found as they advanced through Germany; the sheer scale of jet and rocket technology was far beyond what they expected and even further removed from their own researches. In the UK and the US jet aircraft were being designed and built but none were as advanced as the Ta183 and P.1101 or the Me163 variants. The partially complete P.1101 was taken back to the US and handed over to the Bell Aircraft Corporation. They used the basis of the design for the X-5 which first flew in June 1951. There are striking similarities between the two aircraft but in essence the Bell X-5 was a totally new aeroplane. The Soviets had lagged behind in jet technology until they were given a boost by the new Labour government of Britain with an outright gift of several Rolls-Royce Nene turbojets as well as information and drawings. Their own spy network had also gathered allied technology that went towards developing advanced aircraft within the Soviet Union. Their advancing armies captured various German design and test facilities along with the engineers and scientists working at the locations. Tank’s Ta183 may have been gathered up by the British but the Russians found a full set of plans of the aircraft, along with several other advanced aircraft designs, at the Air Ministry building in Berlin. They now had the technology for a high-performance jet interceptor fighter. These microfilm plans were rushed to Moscow and pored over by Russian aeronautical engineers. There is little doubt that the Mikoyan-Gurevich (MiG) design bureau benefited from the plans. Some sources state that MiG built and flew copies of the Ta183 design, which were developed and adapted as required. Certainly the resulting MiG-15 owes a debt to the Ta183 as does the North American F-86 Sabre which had started life with straight wings but soon gained a distinctive and more efficient swept wing that was firmly based on the captured German technology that found its way to the States. Sweden went one better and built the Saab J29, which looks more like the Ta183 than either the MiG-15 or F-86. Tank himself went on to other things including the building of the Pulqui jet fighter for General Peron in Argentina. Although the aircraft flew it did not enter production, but it bears a remarkable resemblance to one of the proposed variations of Ta183. Britain, America and Russia all benefited from the captured German swept-wing information which enabled the allies to make rapid strides which otherwise may have taken several years. In more recent years, Jock Maitland has been better known as the originator of the Biggin Hill Air Fair, but as a young RAF officer he saw action in various places, including the Korean War. François Prins has the story. Growing up in Scotland, and attending school near RAF Turnhouse (now Edinburgh International Airport) gave Jock Maitland a life-long love for aeroplanes. From the sidelines he would watch the young men take-off and land in their elegant Hawker Hart and Fury biplanes and realised then that he had to fly. By doing this he knew his family, with its long Army pedigree, might not share his enthusiasm. When the WWII was declared Jock was not quite old enough to enlist, so he waited, somewhat impatiently, until he was just old enough and joined the Fleet Air Arm (FAA). He wanted to become a pilot and was fortunate to be selected for training. His first experience of service life was to be shipped off to Canada, where he learned to fly Harvards. On completion of his basic flying training, found that the FAA no longer had a requirement for pilots, so he transferred to the RAF. Even though he had logged time aloft, he was posted to South Africa for pilot training – on Harvards! Jock saw the war out in South Africa and on the cessation of hostilities, left the RAF to return to Scotland and become a lumberjack. However, he remained on the reserve list of the RAF, to which he was re-called not long afterwards. His next tour, in 1950, was with 247 Squadron at RAF Odiham, in Hampshire, first on Vampires and then on the Gloster Meteor. When the Korean War broke out, volunteers were called for from experienced fighter pilots, to fly with the United States Air Force (USAF). On completion of the course, most of the RAF pilots were posted to Sabre squadrons in Germany, but a few went to Korea, some with the 25th Fighter Interceptor Squadron (FIS) at Suwon. Jock Maitland flew his first training mission from Suwon on 26 January and his first combat mission three days later. Regular sweeps along the Yalu River generally brought little or no action, they rarely sighted the enemy, but these sweeps were kept up to maintain a fighter presence over the valley. The patrols were not without excitement, Jock himself was nearly shot down on 3 March flying as number 3 on a patrol over the Yalu. On 14 May, Jock’s logbook has an entry that says, “Dickie got a probable”. Dickie was the then Flt Lt R.J.F. Dickinson, flying as Maitland’s number 2. 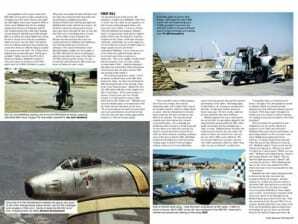 They were part of a formation of 24 F-86s which were at 35,000ft (10,668m) on patrol. When they were about 50 miles (80.5km) from the Yalu, they jettisoned their drop tanks and checked guns, a standard procedure. Dickinson had trouble with his gun-sight and Maitland had trouble with his fuel system. He decided to abort the mission and return to base; they turned through 90º and, as they did, four MiGs were seen diving down on them. As the Sabres broke formation the Russian aircraft sped past them and one nearly got between Maitland and Dickinson, who throttled back and extended his airbrakes. This caused Dickinson to find himself looking straight into the jet-pipe of the MiG; although he had no working gun-sight, he just aimed the nose of the Sabre at the MiG and pressed the button. He saw several hits and followed the MiG down, but broke off before he saw it crash. “An operational tour in Korea was 100 missions,” recalled Jock Maitland, “and I flew 77 before the war ended. In my squadron, we had several combat-damaged Sabres, but none were lost to MiGs.” It was on 24 June 1953 that Maitland was flying as ‘Mission Spare’, an opportunity rarely given to fighter leaders rather than the wingmen. If anyone dropped out the ‘Spare’ would take his place; otherwise, unofficially, one could range free. “In North Korea, at around 35,000ft a flash of wings caught my eyes, far below,” remembers Maitland, “I never took my eyes off it, rolled over, pulled through, aileron turned and went down, in and out of supersonic. The scene rapidly revealed itself and decelerating I saw, very low, a Sabre turning inside a MiG. I slightly misjudged and came out a bit behind, which was just as well, because after the Sabre another MiG was turning neatly inside it. Maitland ignored the tracer and opened fire on the MiG, he saw strikes along the left wing and then unexpectedly, the MiG rolled gently on its back and flew straight into a ridge of rocks. Maitland broke violently and looked around, but the sky was empty. He made for home, low towards the coast and the sea, where MiGs never followed. “We were issued with these one-piece suits for over water operations, which we called ‘frog-suits’, in case we ditched“, recalled Jock. When he landed his ground-crew was delighted to see the smoke blackened gunports on the Sabre and welcomed Maitland with a great deal of enthusiasm. An interesting sidenote to this encounter came when Maitland was going into his de-briefing. A Colonel stopped him and said, “Was that you at Uiju, did you see mine go in?” Maitland replied, “I saw you hit him but I did not see him go in. Did you see mine?” To which the Colonel asked, “Which one was that?” Maitland was irritated by the colonel’s patronising attitude and replied, “The one that was right up your arse, Colonel!” and went into the de-brief. When Maitland was back in the UK he was awarded the DFC, which must have been recommended by that same Colonel. Maitland saw other action during his time in Korea, but the first encounter has remained vivid in his memory. Another surprise he recalled was when he visited a shot-down MiG that had been recovered by the Royal Navy. On removing the engine covers a genuine Rolls-Royce Nene engine was revealed. Several boxed examples of the Nene were ‘given’ to the Russians by the British Labour government of the day. That they turned up in the ‘Korean’ MiG-15 is no surprise. Russia made their own copies of the Nene and immediately gained advanced jet-technology by way of a short-cut afforded them by Sir Stafford-Cripps and others. After his time in Korea, Jock Maitland returned to Britain as an instructor at the Day Fighter Leaders School on Meteors, “A bit of a let-down after the F-86!” Then onto Hawker Hunter F. Mk Is and later the F. Mk 4, before moving to Amman in Jordan to take over 249 Squadron flying de Havilland Venoms on ground-attack duties. However, by 1957 the British Conservative government made severe defence cuts and declared the end of the manned fighter. All the RAF Middle East Squadrons were disbanded. Maitland resigned his commission in protest. “No one noticed!” he reports. Staying in aviation, Maitland moved to Croydon Airport and instructed on Tiger Moths and other aircraft. During the 1950s there was a renewed interest in aviation and Maitland was keen to expand his flying interests. Together with a business partner he started Maitland Air Charters. However, he realised quite early that new housing was engulfing Croydon Airport and that aviation from the established base would cease in time. Consequently, he decided to move his base of operations and took a lease on RAF Biggin Hill, which he opened as a civil airport in 1959. To promote his air charter and travel business and aviation in general, in 1963 Maitland organised the first Biggin Hill International Travel and Air Fair, which was held over five days. It was a success. At the Air Fair the general public were able to go on board airliners and get a flavour of air travel. Jock built up the Air Fair and, later with son Jim, he headed a small team that organised and promoted the world-famous event, which continued unbroken until 2010. For his achievements in civilian aviation Jock Maitland was awarded the Jeffrey Quill Memorial Medal and the MBE. Now retired he still meets up with old friends and is as sharp as ever and retains his unbounded enthusiasm for aviation.